In 2016, George Square in the centre of Glasgow was turned into a giant street football venue for the Homeless World Cup. National teams played between the 10-16 July, with Mexico emerging victorious in both the women’s and men’s competitions. Over the course of the week the matches were watched by an estimated 80,000 spectators. The Homeless World Cup Foundation is a charity registered in Scotland which aims to empower, inspire and to improve the lives of men and women who have experienced homelessness across the world through football. All of this was made possible by the dedicated team of volunteers, most of whom had also experienced homelessness. 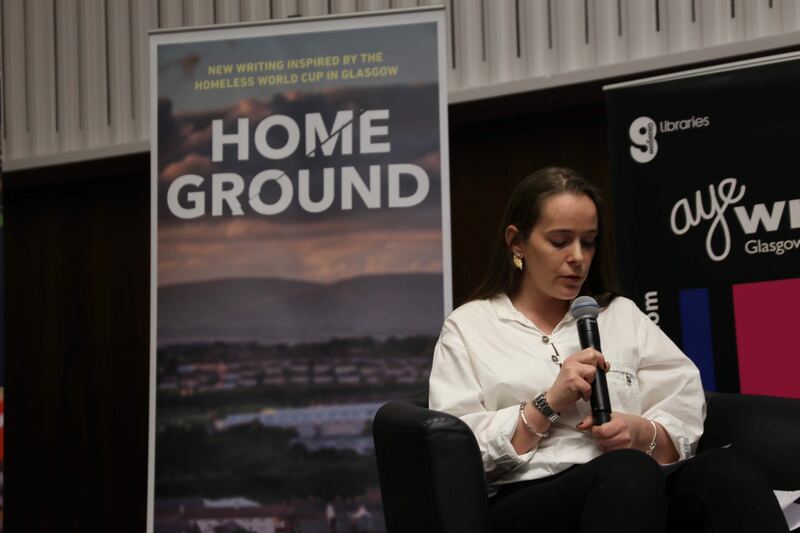 The resulting work went into an anthology entitled Home Ground: New Writing inspired by the Homeless World Cup in Glasgow, edited by Welsh and Strachan. The anthology was published by Freight Books, headed up by Adrian Searle, another graduate of the M.Litt. in Creative Writing. It includes a mixture of new writers who have experienced homelessness, alumni and professional writers. However, there are no biographies, partly because as Welsh highlighted, the contributors were keen to echo the equality which they discovered whilst sitting around the table discussing writing and literature. The writings cover a range of hard-hitting subjects relating to homelessness from sexuality and health to drugs and, of course, death. Nevertheless, Welsh said the ‘texture’ of the writing also revealed the incredible strength, humour and generosity which characterised their lives and voices. Freight Books produced 10,000 copies of Home Ground which were given out for free across Glasgow in libraries and health centres. Strachan said that here at University of Glasgow, copies disappeared like hot cakes from the Library and John Smith’s Bookshop. Free copies were also distributed during the book launch event which opened the Aye Write! Festival on 9th March 2017 at the Mitchell Library. Welsh and Strachan chaired the event, which included readings and interviews with some of the contributors, which they both found quite emotional. Welsh hopes that the book will give readers an insight into the variety of ways that people can become homeless and what it’s like to experience it. Furthermore, Welsh and Strachan firmly believe that literature is the gateway to empathy, and so hopefully readers will reserve their judgements and develop a more empathetic and kind attitude towards the homeless. Welsh insisted that the publication of Home Ground was only the beginning. The Homeless World Cup might have kicked off the creative writing workshops for those who have experienced homelessness, but the workshops have carried on. The writers who have experienced homeless have so much more to say, and others are yet to find their voices. They don’t want to be defined by miserable images like the damp cardboard box. Welsh and Strachan want these workshops to thrive in Glasgow and help to empower an often ignored and derided community. The book is also available as a digital download free of charge for a mobile device or for a Kindle compatible download. If you would like to find out more about the writing workshops or want to get involved, you can contact us at arts-ke@glasgow.ac.uk.